Aryn is the newest member to join the AKVRV team. 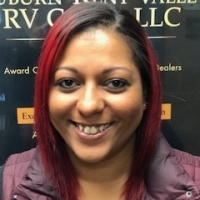 Her journey into the RV world is just beginning. She has a marketing background and would like to put her skills to work. She enjoys the customer interaction and has really worked hard to get to know the customers and their rigs. As each one is special and every RV is unique in it's own way.We are happy to have her here with us and we think you will be too. Aryn has fit in well despite the challenges of running a busy counter and juggling the phones. She loves to ride quads in the dunes and enjoys target practice in the rock quarry. She has three girls that keep her quite busy as well. Update: Aryn has now been with us for four years now and man is she exhausted!! No just kidding......she is amazing. She has managed to make this place hers and the customers know her well. She's had a huge part in establishing everyday systems and holds the place together despite our best efforts to ruin her day.